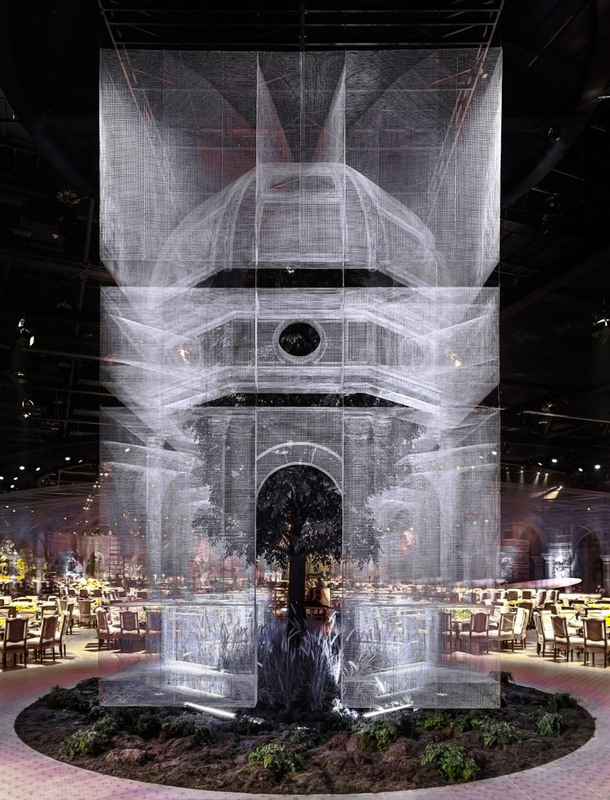 As part of a royal event in Abu Dhabi, Italian artist Edoardo Tresoldi (previously) was tasked with the creation an immense environment of architectural elements built from wire. The variety of objects fully encompass the event space, creating elegant partitions and environments within the 7,000 square meter space. The installation was designed and built over a period of 3 months in collaboration with Dubai-based studio Designlab Experience. Lit from both above and below, the suspended wire domes, columns, and arches have a translucent ghost-like appearance, referencing classical architectural with Tresoldi’s modern aesthetic. After the event, sections of the piece are scheduled to be re-installed separately in universities, parks, and museums across the UAE capital. You can see many more of Tresoldi’s wire installations on his website.